The Moto Z is a phone series like no other: all devices have a magnetic rear plate onto which Moto Mods can be added to give their host phone different features and capabilities. From more battery capacity, to a zoom lens camera, pop-out keyboard, gaming controller, and beyond. It's also a phone series that, despite this future-thinking Mods feature, has lagged behind the competition. And while the Moto Z3 Play looks to advance the series, thanks to its new greater screen-to-body ratio (it's an 18:9 aspect panel), it seems to be playing games within its own line-up, not to mention against the competition. The US/China-exclusive Z3 (proper, not the Play, which will offer 5G in 2019) is more powerful and cheaper, while the likes of the OnePlus 6 add pressure onto Moto's flagship series. Given that Motorola had committed to three generations of Moto Mods, bringing us up to 2018 (i.e. now), does the Z3 Play therefore represent an end-of-the-line product, or feel like a true refresh with legs that'll last into the future? It was mid-2017 when we reviewed the Z2 Play, a phone which, even then, was on the cusp of outdated. The Z3 Play takes the footprint of that phone, but modernises it to more current standards. Predominantly this is achieved by the Z3 Play maximising the screen-to-body ratio, embodying an 18:9 aspect ratio display, which is now a large-scale 6-inch OLED panel (up from the Z2 Play's 5.5-inch panel). By changing the screen format, the Moto's bezel has shrunk considerably – but the Z3 Play still has a bigger 'chin and forehead' compared to plenty of other flagships out there. Think of the Xiaomi Mi Mix 2S, as one example, which is approaching bezel-free, or the with-notch Huawei P20 Pro, both of which are more compact characters. But the Motorola does avoid the notch – we're talking about the black-out dip to the top of the screen, as seen in the iPhone X if you're unsure – which is a good move (although we expect Moto to go notched eventually). The Z3 Play's larger screen makes one other significant different for the series: there's no space for the fingerprint scanner to live at the bottom of the phone (although, for whatever reason, there has been space to squeeze in the "motorola" branding (all in lower case, of course), which we don't think was at all necessary), and as a Moto Mods phone there's no scope to use the rear either. Instead the Z3 Play has opted for a side-positioned scanner, which sits within natural reach when holding the device. Its positioning makes sense, although it can't be used for gesture controls like some previous versions of Moto Z series phones, while the smaller scale means it's more prone to login failure than a larger rear/front-positioned scanner. With no Mod attached, the Z3 Play is a fairly slender device, at 6.7mm. The back is glass, not metal, which doesn't have any real implication to visual design as it'll always be covered by a Mod or case. The problem when adding a Mod is the additional size. With the included battery pack attached to the phone, for example, it feels like a thick and weighty wedge in the hand; it's more like a flagship of old and less 2018 in its feel. Overall, then, the Z3 Play shows improvement for the series. But it's shot itself in the foot by the more recent reveal of the Z3 (a US/China exclusive), which is far more powerful and cheaper, if you can accept the network lock to Verizon (i.e., it's US only). Sure, the Z3 proper doesn't include the battery Mod in the box, but pound for pound we'd choose the more powerful device each and every time (even if it was Three/O2/Vodafone locked in the UK). It seems an odd position to have a subsidised-by-carrier phone undercut the less powerful model. A strange game to, er, 'play' indeed. Are minor improvements enough when other makers are accelerating design offerings to a whole other level? Because of its Mod-related footprint restrictions, the Z3 Play's design just isn't as new and as titillating as what you'll get from the likes of Huawei, Samsung and others. Sure, these makers don't offer Mods – but when LG did, back with the G5, it only lasted for one generation and then (sort-of understandably) fell off the map. As you may see from the bullet-point specifications above, the Z3 Play doesn't go all-in when it comes to processing power. The Snapdragon 636 platform at its heart puts it in the same ballpark as the Moto G6 Plus, which pitches the phone mid-level rather than flagship. Even the Nokia 7 Plus has a mite more power available than the Z3 Play. And that makes Moto's $499 (around £450) asking price just too much. A OnePlus 6 is less than that. Of course, what really matters is how a phone operates in the real world. We've lived with the Z3 Play for a full week – including while at a rural wedding where there was no mains electricity, where charged Mod battery packs were a life-saver – and have found its power ample for everything we've needed. That's the dichotomy of modern smartphones: in 2018 even middling power is perfectly acceptable. Sure, loading up South Park: Phone Destroyer was slower on the Moto than the last-gen Google Pixel XL by a full five seconds in our side-by-side comparison, but in isolation that's not something you're likely to notice. So more power would be better – it might mean the camera app would load quicker, for example – but it's not an end-game decision in a phone such as this. In terms of battery life the 3,000mAh cell at the phone's core performs fairly well, achieving in and around 16 hours per charge with a fair whack of daytime use. But that's not as long-lasting as we had expected from a middling processor and 3,000mAh battery. Gaming in particular seems to be hard on the Z3 Play's battery, while the software's assessment of the upper portion of the battery (from 80-100 per cent) seems poor, as this drops away faster than the remainder. To get far more extended battery life you'll need a battery Mod attached. The one in the box brings the total to 5,000mAh, which is a huge capacity by any phone standard – if you can cope with the added bulk (not that it needs to be attached at all times, you might switch it out for a case). On the software front, Motorola's approach with its devices is to not interfere too much with the groundwork that Google lays with its Android operating system. In the Z3 Play that means a Moto app, where all additions are held in the one place: display, gesture and voice are housed here, so you can refine what shows and when, how physical actions have a reaction, and setup Moto's own more advanced tweak of Google Voice. In terms of cameras, the Z3 Play apes the G6 Plus once more (much like its core power), offering dual rear cameras. This 12- and 5-megapixel duo can be used for depth-effect portrait and other modes, including YouTube Live and Cinemagraph (GIF creation and editing), along with Google Lens integration. In terms of versus-the-flagships performance, the Z3 Play's camera setup isn't quite there. It's a little slow to load, sometimes with the live view playback stuttering a little. The Face Filters (Insta-like at ears and so forth which augment their chosen subject) also can cause slowdown. In terms of images, we've been able to acquire some good shots from the Z3 Play in its normal camera setup (there's a manual mode if desired too). Exposures are accurate, even in slightly more challenging lighting conditions, although there's often a little unwanted grain to shots and finer details lack compared to the top-end competition. Detail diminishes as the light fades, but being able to shoot isn't off the cards. Ultimately, the Z3 Play's camera app is just trying a little too hard for the hardware on which it sits. The results aren't bad, but in a world where we're spoiled by impressive mobile phone cameras, and with a lack of relevant Moto Mods (the Hasselblad add-on isn't great – just go buy a decent compact camera; the 360 degree add-on is too pricey), there's just not the distinctive sell here to really appeal. 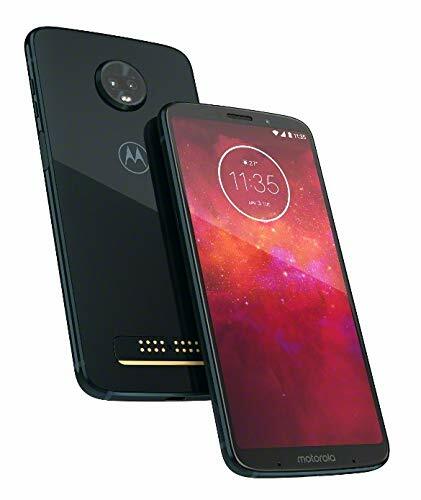 The Moto Z3 Play brings the series up to date thanks to that 18:9 aspect ratio display, but this model stands in the shadow of the Z3 proper – which is not only more powerful but cheaper – and can't hold its weight against other flagship leaders of the moment. There's an increasing sense that Mods may have had their moment too, and with only a bulky 5G one coming in 2019 the current glut of battery add-ons and cases isn't as enthralling a prospect as could be. Having that battery Mod in the box is a great touch, but it adds so much bulk to the phone that you may reconsider carrying it around at all times. No, you can't add any modifications to this one. But you don't need to: the OnePlus is just as affordable affordable, more powerful, longer-lasting and has better cameras than the Moto.